Annelotte de Graaf, better known under her stage name Amber Arcades, has led a pretty interesting life so far. I touched upon some of this in my Bands to Watch feature on her following her appearance at SXSW 2016. De Graaf’s serious endeavours are contrasted with the gentle nature of Amber Arcades’ music: De Graaf previously worked as a legal aide, and she is currently working in human rights law with people who have fled from Syria. On the musical front, the Dutch singer/songwriter decided that she would record her first album in New York, spending her life savings on a flight to the city where she would create ‘Fading Lines’. Shane Butler and Keven Lareau of Quilt and Jackson Pollis of Real Estate provide guitar, bass and drums respectively for the album, with Meg Duffy providing additional slide guitar on the track ‘Apophenia’. De Graaf says she was inspired by “time, continuity, coincidence and magic”, and the album certainly encompasses this abstract range of influences. ‘Fading Lines’ is a shimmering, dreamy and stylistic collection of music,10 songs in length, and produced by Ben Greenberg at Strange Weather studio in Greenpoint, Brooklyn. It’s full of hypnotic synth beats, dreamy vocals and twanging guitars. The album opens with the enigmatic ‘Come With Me’, a bright, dream-folk number that sets the tone for the rest of the album. The folksy feel runs throughout the LP, with blues and country influences appearing in varying degrees throughout, along with otherworldly synth sounds and steady drum rhythms. This combination comes together to create a collection of music that is modest, ethereal and captivating. ‘Right Now’ is a standout on the album. With its dreamy folk aura and rattling guitars, it’s easy to see why it was shared ahead of the album’s release. It’s the type of song that doesn’t sound like it’s fixed or limited to a particular time or place. As De Graaf sings “right now” over and over in the chorus, you can imagine it being relatable to anyone. As with ‘Fading Lines’, the guitars are a predominant feature here, as they crisply ring throughout the track, matching well with the unearthly melody of De Graaf’s voice. ‘Apophenia’ begins gently and simply, before introducing a country resonance in the form of the mournful rhythm of the slide guitar that picks up towards the end of the track. De Graaf’s vocals are paired with stripped back, ethereal sounds: it’s a subdued interlude after the enigmatic ‘Right Now’. Title track ‘Fading Lines’ begins with a bright jingle of guitars, met with a gentle drumbeat and De Graaf’s enticing vocals. The lyrics “I look around / nothing’s what it seems” speak of the slightly surreal nature of the track, which plays out like a whimsical dream full of spiralling guitars. ‘Turning Light’, the penultimate song, is the other of the two singles that were released ahead of the LP. The subdued drumbeat and ghostly sounds that fade in and out throughout the track form an enchanting and mysterious picture, but with lyrics that hint at a more serious theme: “we saw the ending / before it had arrived”. The album finishes up with ‘White Fuzz’, a haunting, crisp track with De Graaf’s vocals standing out against the music. It’s a tender end to the album, beginning with the lyrics ‘if only we could stay the same’, speaking to anyone that’s hesitantly undergone a life change. ‘Fading Lines’ is one of those albums to listen to during your downtime in the evenings while unwinding after a stressful day. It’s an evocative and wistful collection of bright tunes and softer moments and an altogether impressive debut from De Graaf. ‘Fading Lines’ is scheduled for release on the 3rd of June on Heavenly Recordings.The rest of the year will see De Graaf at a variety of festivals across Europe from Green Man in the Brecon Beacons in Wales to Amsterdam Woods Festival. 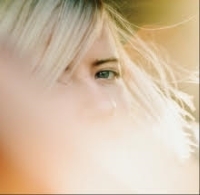 For more on Amber Arcades on TGTF, go here.